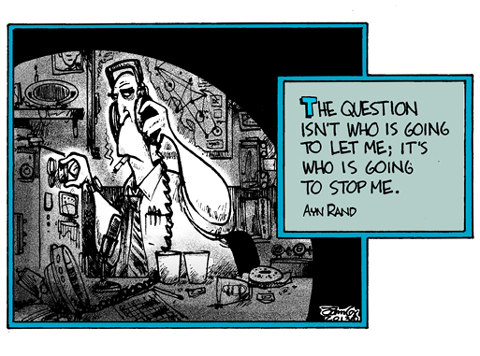 My favorite Ayn Rand quote. In the context of the cartoon, her quote is a little creepy. We mustn't forget nefarious types read Rand, too. Some of them can be a little creepy if taken out of context. But, here's one that will keep you awake at night! (2) she insisted on describing a whole political way of thought mainly using two works of fiction that were both the size of "War and Peace". Nobody read them. Problem is that we have people in power who read 1984 and considered it a how-to manual. No worries! Eric Holder is on the case! This page contains a single entry from the blog posted on June 24, 2013 12:20 AM. The previous post in this blog was Graphic Studio Logo Idea. The next post in this blog is Endless Bummer.